This entry was posted on Wednesday, July 1st, 2015 by Frances Ryan. Why journal all month long? Well, to start with, I want to get back into the habit of blogging. My hope is that by committing to journaling every most days* of the month, it will become part of my healthy routine pattern again. 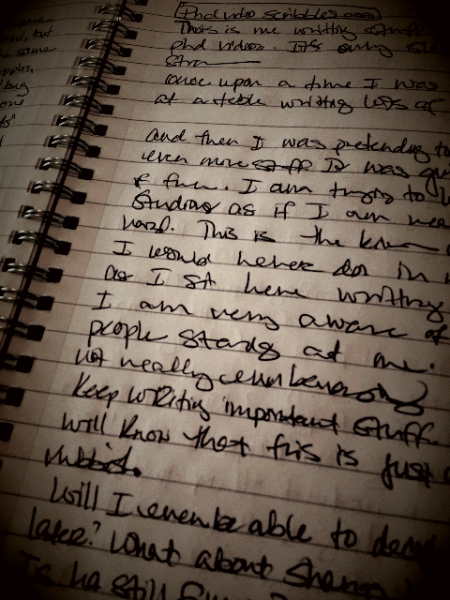 But it’s more than just writing every day, as I already write most days. It’s about actually blogging what I write. Why is it important to me to blog what I write? I suppose it’s because I know that my writing helps other widow(er)s and people suffering from PKD or ITP. But it also helps me to focus my thoughts and emotions when I have to prepare them for “public consumption”. And, importantly, it lets people know how or what I’m doing—from those who are looking out for my well-being and for those who are travelling the world vicariously! What will I journal about? Everything, anything, and nothing! I imagine there will be a hodgepodge of stuff from mindless rants to emotional releases and from my adventures to my crafting fun—and even a bit of PhD stuff for good measure! But—and this is where you come in!—I am open to suggestions at this point, too. And that means that if you’d like to request a topic or ask a question, I’ll do my best to answer you. I’m even willing to do a wee adventure post (with photos!) if there’s someplace you’d like me to explore on your behalf. So if you’d like to have your say in the content of this month’s post, comment below or send me a private message! * I have to acknowledge that I might miss a day or two, but I will really do my best to not miss more than that over the course of the month! I think it’s probably way past time for you to revisit the Antonine Wall…perhaps areas other than by Kinneil House. Or perhaps take a canal trip. Check out the beaches! And there’s always the tour at St Giles! I’m sure that you’ll have plenty of wonderful adventures to share. And I look forward to all of them. Scotland through your eyes,for someone who hasn’t left this country. The country around you. A tour of your school, home ect. and favorite places. Mum, I don’t know that I can get to the wall without a car, but I’ll share photos if I do. I will certainly make a trip to the Kelpies along the canal though! Oh! And I’ve done a photo tour of St Gile’s already. But you haven’t done a photo tour of St Giles from the roof! And I agree with Carolyn…a tour of campus would be nice. With perhaps your first campus as an added bonus! Enjoy the canal trip! Too bad Neptune’s Staircase is so far from you. A campus tour is certainly possible ... but I don’t know how exciting it will be. Still, I’ll do my best.